If we want to default to any available font from this family available on the user system then we can use serif. If we want to default to any available font from this family available on the user system then we can use sans-serif. If we want to default to any available font from this family available on the user system then we can use monospace. 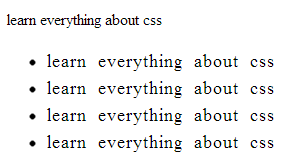 So with this all this new knowledge on fonts let us go ahead and change the fonts in our html. The fonts mentioned above need to be present on the user’s system, so that the web page could use it but in the case of Web Fonts we can specify to download these fonts on the user’s machine. But sometimes this might not be the right choice as this might lead to ownership issues because of the font’s ownership. 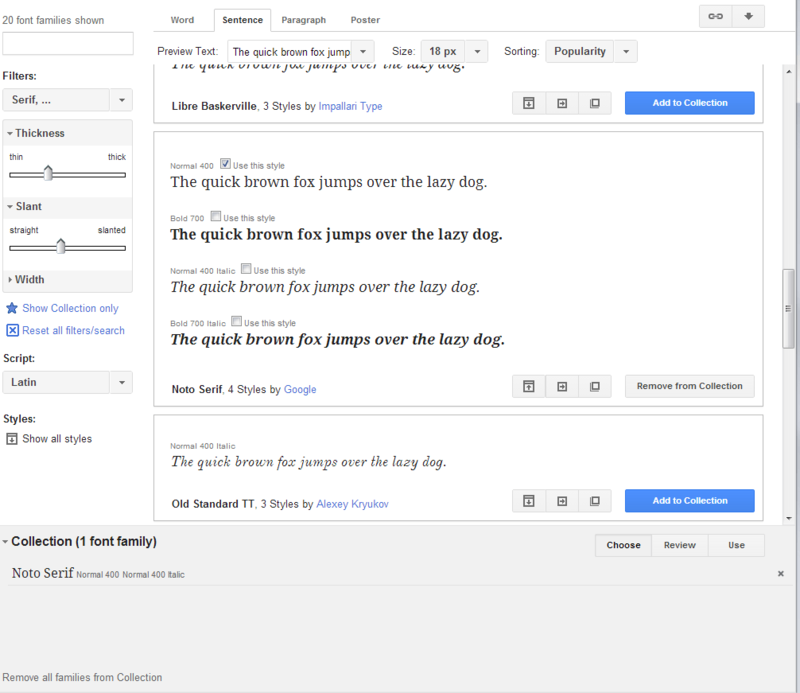 The best solution around that is to use a Font Server and better yet use Google font server. To get the specific font all we need to do is get the link of a particular font from the Google font server and include it in the web page so that it is downloaded as and when it is needed. Let’s try to use Web Fonts and for that we need to go to http://www.google.com/fonts. 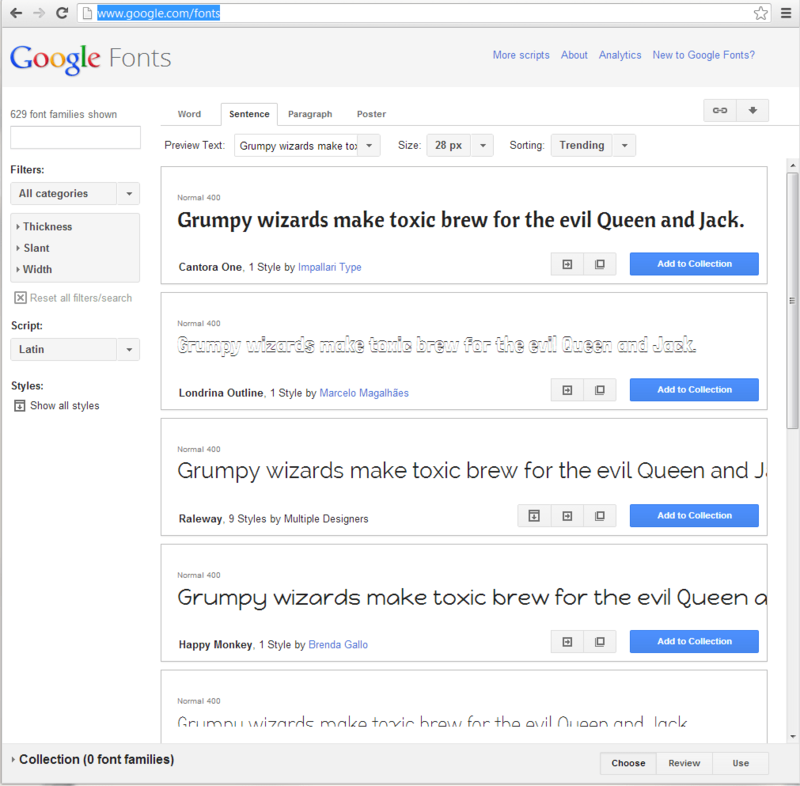 On the left hand panel we can see various options to filter and customize our fonts. We also have multiple option to select the text we want to analyze, the size we want to analyze and the various way we can sort it. We can also see it in poster, paragraph, sentence or word. To use a particular type of font we need to add it to the collection and click on Use at the bottom right corner of the page. Once we do that we see all the instructions as to how we can use that font in our web page. 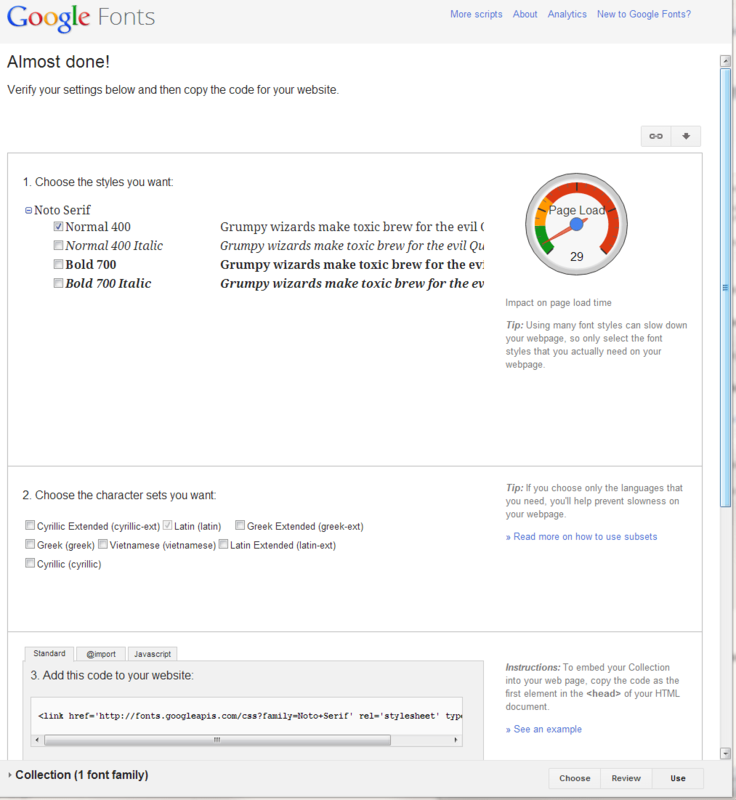 And before we use it we can include or exclude the stuff we want and also see the load time of that font in the web page. We will go ahead and use this font in our webpage for paragraph and headings. It works really well even after the fact this font is not present on my system. em – It is a scalable unit. 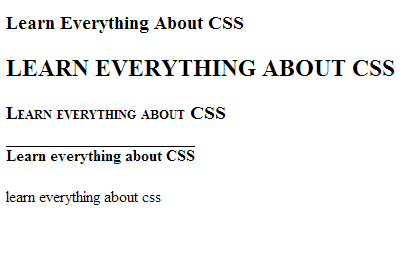 1em = current font size. So if the current font size is 16 px then 1em = 16px and 2em = 32px. percentage – It is similar to em but the current font size is 100%. So if the current font size is 16px then 100% = 16px and 200% = 32px. px – These are the fixed sized unit where 1px = one on screen. keywords (small, medium, large, etc) – These are also fixed sized units. One point = 1/72 of an inch. rgba – This is similar to rgb with an additional attribute of a which repsents the opacity. The value of a ranges between 0(Transparent) and 1(Opaque). italic – This will italicize the content. bold – This will make the content bold. Also if font style is already set before in the hierarchy then we can reset it to normal which will remove any font style that is already present. The “font-kerning” property controls metric kerning, kerning that utilizes adjustment data contained in the font. 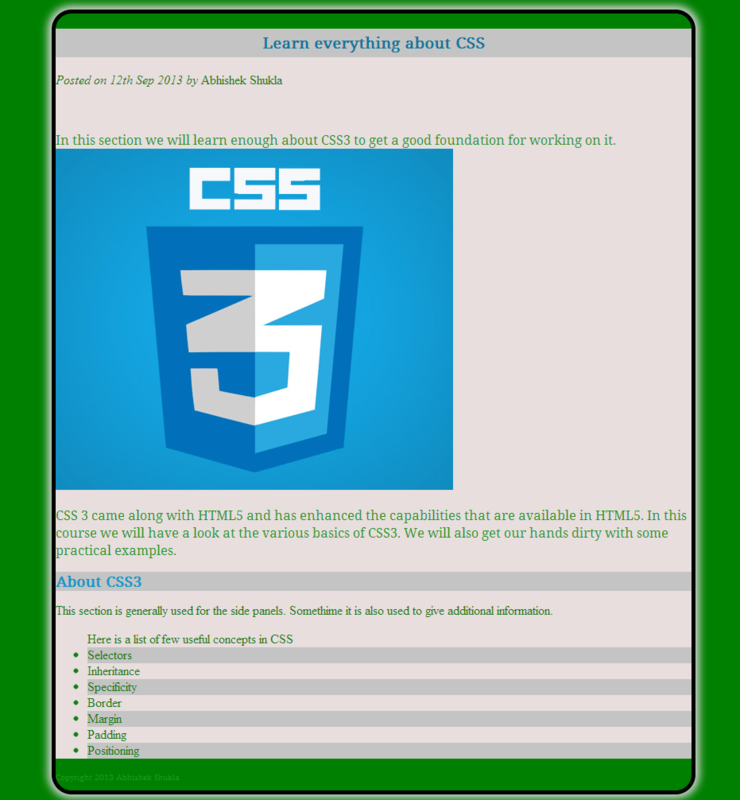 The CSS line-height property is similar to leading in desktop publishing – it determines the “line height”. This results in lines of text appearing closer together or further apart. 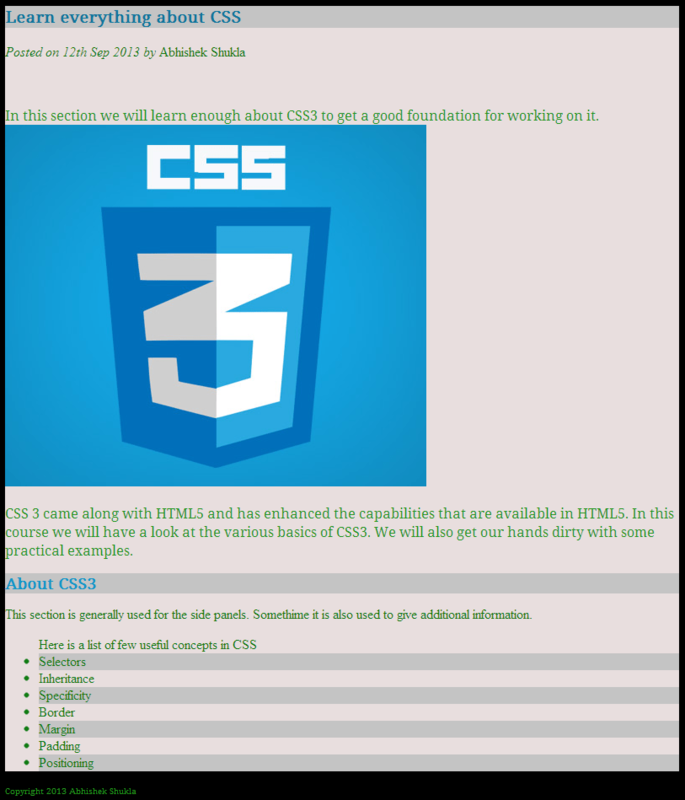 In CSS3 we can consider our page to consist a set of boxes. Every element that we have could be considered as an individual box. So an image will be a box so will be a paragraph or any other element on our page. It is the line around each of these boxes. It can be set for all four sides of the element or individual side. All these boxes are separated by space which is known as margin. It can be set for all four sides of the element or individual side. 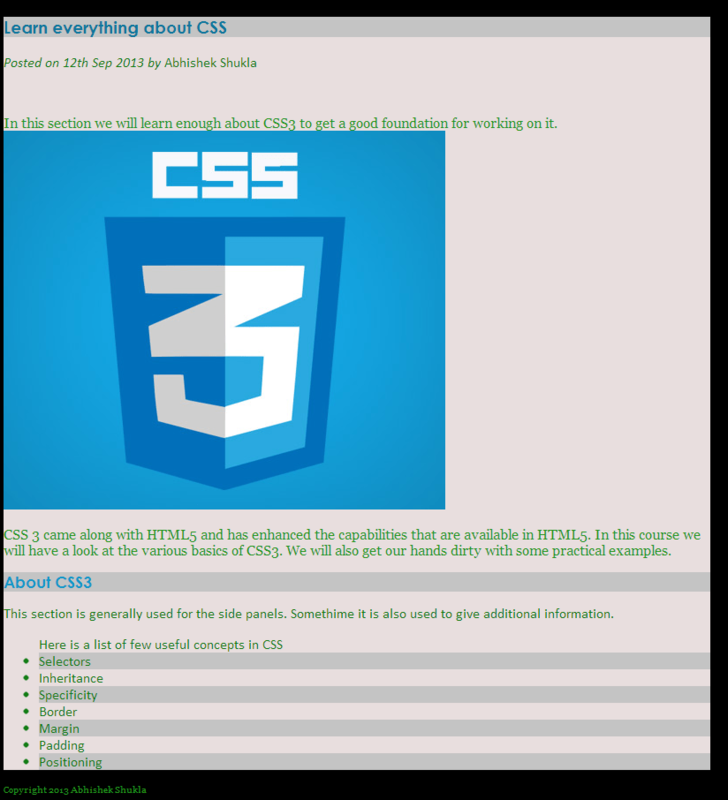 An inline box cannot have top and bottom margins. It is the space between the border and the content of the boxes. It can be set for all four sides of the element or individual side. An inline box cannot have top and bottom paddings. The various inline tags are as below. These tags cannot have top and bottom margin. Any questions. comments or feedback are most welcome.